It is generally very easy to find articles related to Windows OS. The Apple community might enjoy the supremacy when it comes to high-end products (entirely depends upon the perspective), but, that comes with a price (too high a price actually). However, the main problem is that many programs and software which are commonplace in the Windows environment are not made for Apple ecosystem. The same applies to Media players also. Windows has got an awesome collection of media players for the users to choose from. But, those familiar with Windows might find it odd when they encounter the absence of those media players in the Apple ecosystem. But, it is not entirely a bad thing also. There are plenty of other options in the Mac Media Players section. 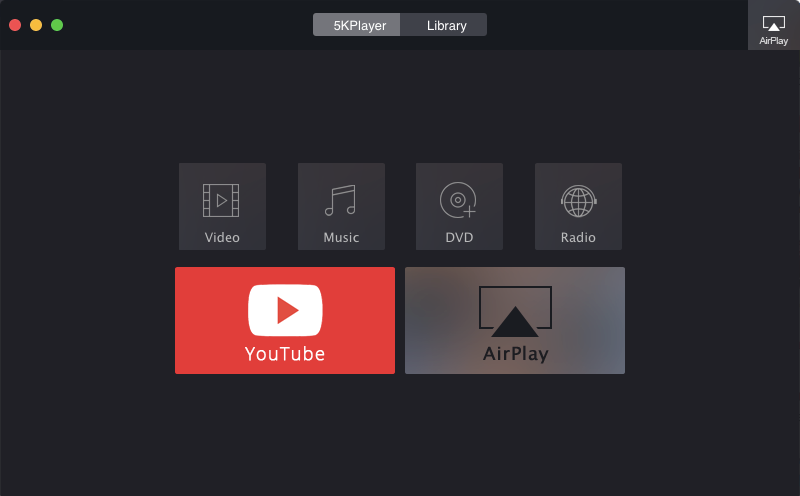 And we are here with a list of some of the best media players for the Mac OS X. It isn’t easy to compile a list of media players for Mac OS. While the Mac platform enjoys a more professional crowd, it also makes it more difficult to search for products for the common folk. But, there is nothing to fear. We are here with a list of the best available Mac media players for OS X. This list is by no means an exhaustive one. The choice of a media player to use entirely depends on the user and the use case scenario. 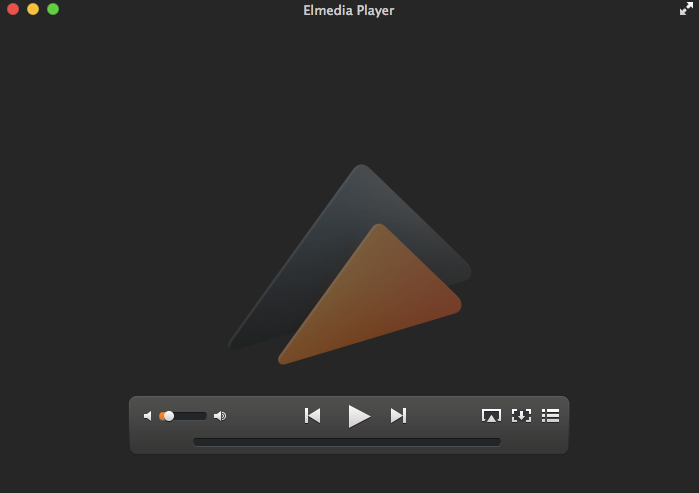 When it comes to media players, there is hardly anyone who wouldn’t have heard about VLC. This media player from VideoLAN organization is a multi-platform media player. And it rightly deserves a spot on the pedestal even amongst those of Mac media players. There is hardly any video or audio extension that VLC cannot handle. And with various plugins, you can easily overcome this shortcoming. It is not only a good audio/video player but also a great streaming program which also doubles up as a powerful screen recorder. It is equally useful for a casual user as well as a power user. The main drawback of VLC is that since it is cross-platform, it is not really customized explicitly for Mac. This can be seen in the way it literally drains the battery and the number of resources it uses. The interface may also seem outdated when compared with the smooth OS X.
Don’t get fooled by its name. QuickTime Player is really a great option amongst available Mac media players which allows you to play, record, and even edit as well as share audio and video files. The controls and interface are minimalistic which give it a really smooth and refined look. Apple believes in its policy of keeping it simple and useful. And they stood up to that when they developed the QuickTime Player. As a native app to OS X, the QuickTime Player is battery optimized for a Mac. Apple has also made sure to integrate AirPlay support for easy streaming to and from supported devices. The only downside to this media player is the number of file formats supported by it. You would have to take help from a third party software in order to play more than a few of the very famous file formats. Also, one may have a headache if one is installing it for the first time. While you get it preinstalled on a Mac system, installing it from other sources can be a bit of a hassle due to large download size. “Simple. Powerful. Beautiful.” That is what the tagline on the website says and it’s true too. MPlayer X boasts of a wide variety of supported formats even by the standards of other multi-media format handling Mac media players. This allows users to play any media format without any additional plugin or codec package. They literally say that this media player can play any format in the world. You also get easy swipe and touch gestures for smooth and easy control. You can also play YouTube videos on MPlayer X. And, it is not limited to just YouTube. Many other services are supported. There is also intelligent subtitle integration and playlist detection. There is not much of a drawback to this media player. However, there is one thing which may annoy many people. And that is advertisements. And, for some people, that really takes the fun out of the media they are playing. When it comes to media players, one can hardly miss Kodi. The one open source player which is in its true sense, multi-platform. And this is demonstrated by the fact that you can install Kodi on to a Raspberry Pi. With the thousands of streaming options with great free and paid content, Kodi isn’t something to be missed out on. You can customize it to your liking with the help of skins. You can also easily increase the functionality with the help of third-party plugins. Not only streaming content from the web, Kodi also supports playback of local media and is a great option to play HD and 4K content. 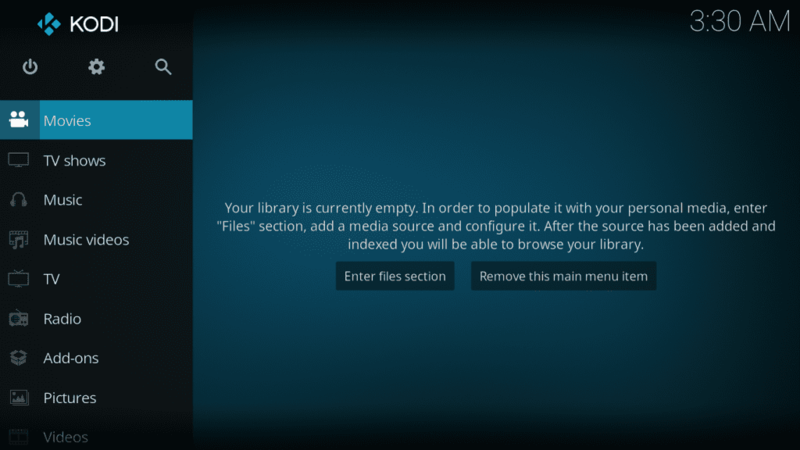 The only problem one may have with Kodi is pirated content. While there are a plethora of genuine sources, because of its open source nature, the Kodi environment also has plugins which make use of and display pirated content. This is a serious legal issue and may lead to a lot of problems if one is not careful in their choice of plugins. When it comes to playing high definition content as well as 4K and 5K videos, there is hardly any media player that is on par with 5KPlayer. As the name suggests, this media player is made to run 5K and other high definition media. There is also an added option of viewing and downloading videos from online sources such as YouTube, Vimeo, etc. Also, you get a built-in radio player. Another important feature is AirPlay support which lets you stream media to and from your Mac to other AirPlay supported devices. However, despite support for high definition content, people may debate about the picture quality as well as color saturation. Although they can be corrected, that is not something everyone prefers to do while they play their content. 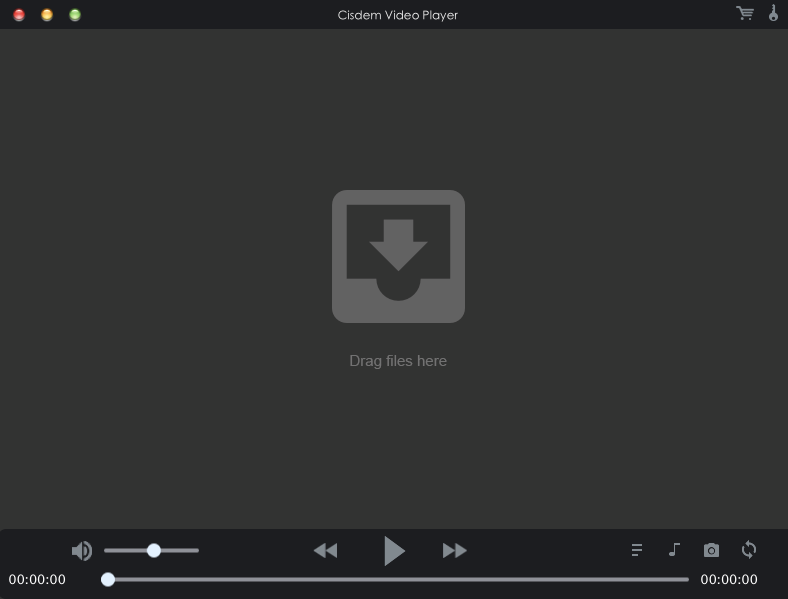 Cisdem is a relatively simple video player as compared to others on this list. However, that is not a reason to look down on this media player. It can easily handle almost any kind of audio and video format thrown at it with ease. It also boasts of support for more than 50 audio/video formats, doing away with the necessity of installing codecs. With security and privacy an issue nowadays, it may be comforting for people to know that Cisdem Player claims to be completely free of spyware and doesn’t track user actions. The only downside to this media player would be that you need to pay in order to access the in-app convert feature which allows you to convert the media to different formats for use in various devices. This media player may well deserve the title of the cream of the crop. 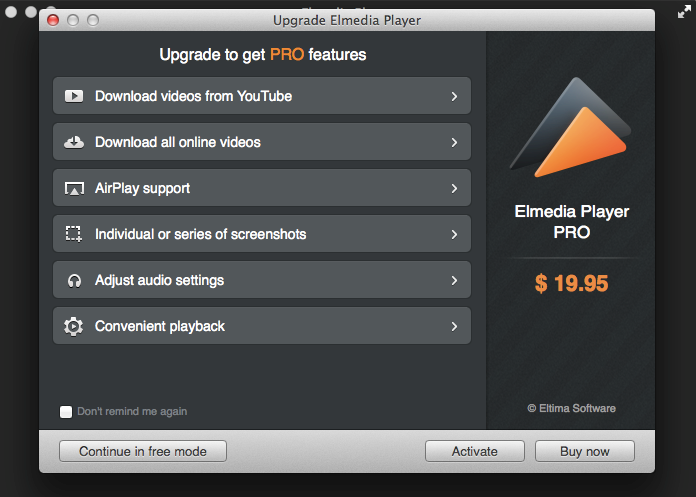 One reason to support this is that Elmedia Player supports AirPlay which even VLC doesn’t support at the moment. Another good reason is that there is an equalizer featured in the player which is pretty uncommon even for Mac media players. But, if you are an audiophile then this may very well become the reason you opt for the Elmedia Player. You can also play online videos on Elmedia Player. There is also the option to keep the window of the player floating above other apps. An interesting feature is screenshot series. This allows you to time an interval so that multiple screenshots of the video can be taken for later use. For those who own a Myo armband, Elmedia Player works perfectly with it. This allows users to easily control playback, volume, and other things. Minor adjustments can also be made to the video in Elmedia Player. You can flip or rotate the video image, adjust color, brightness, contrast, etc. You even have the option to edit the subtitles of the videos to some extent with multiple languages supported. The Elmedia Player is capable of easily playing HD content. Also, it is relatively easy to fix audio and video sync errors. The player also allows you to download online videos which you watch. There is a paid version of the app which gives you all the PRO features. However, for those who don’t need to extensively use these features, the free version offers more than necessary options to work as an all-round media player for a Mac. With so many great options out there for Mac, it is really hard to decide which is the best. But, when taking overall performance and productivity into account, we can safely say that Elmedia Player manages to take the top spot amongst all the Mac media players mentioned in the above list. It is a tough competition and one may not agree with our decision. It is entirely up to the user to decide which media player suits them the best. The Elmedia media player manages to incorporate most of the functionality which an everyday user or even a pro user may need. The post 7 Best Mac Media Players for Mac OS X in 2018 appeared first on Agatton.